Bimal Mitra, exceptional Indian writer in the history of Bengali literature in the twentieth century. 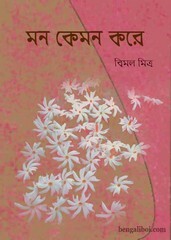 The first novel 'Chai', become famous by writing the novel 'Saheb Bibi Golam'. About five hundred stories and hundreds of novels are written by the author. He wrote literature in both Bengali and Hindi languages. Today sharable book of this author- Mon Kamon Kare. The ebook pdf has 170 quality pages, 10mb file size.